Editor’s note: Shari Hogshead and Paul Gauthier regularly lead CONC winter skiing and summer hiking trips to Europe. This article is about the next adventure they have planned for club members – a June cruise from Norway in which participants can disembark for hikes, bicycle rides or other activities. Paul and I have been wanting to take a 12-day journey on the Hurtigruten, one of the Norwegian mailboats that ply that long, gorgeous coast from Bergen to Kirkenes on the Russian border, stopping at towns, villages, islands, and settlements along the way. What you sleep through on the outbound journey, you see on the return voyage, since the trip is planned so that you have daylight for all of the journey. Also, we have planned to travel during the traditional best weather window and during some of the longest days of the year. The journey is all inclusive as far as meals are concerned, although you are on your own for bar bills. There are also additional costs for shore excursions, such as hikes, kayaking, cycling, etc., but you can always just go ashore and take a walk on your own at no additional cost. We have booked 11 outside cabins with windows. Prices range from $4,023 per person for a Polar Outside Cabin with two beds, one of which makes into a sofa, to Arctic Superior Cabins with one queen bed at $4,357 per person double occupancy. Our ship, the MS Nordlys, is 400 feet long and houses 469 passengers. It was built in 1994 and is being upgraded between January 2019 and our voyage. All rooms are en suite (your own toilet, shower, and sink) and we enjoy the “select group” pricing, which includes full board (breakfast, lunch and dinner), free wifi on board, non-alcoholic beverages at meals, as well as use of the sauna. Alcoholic beverages are NOT included. 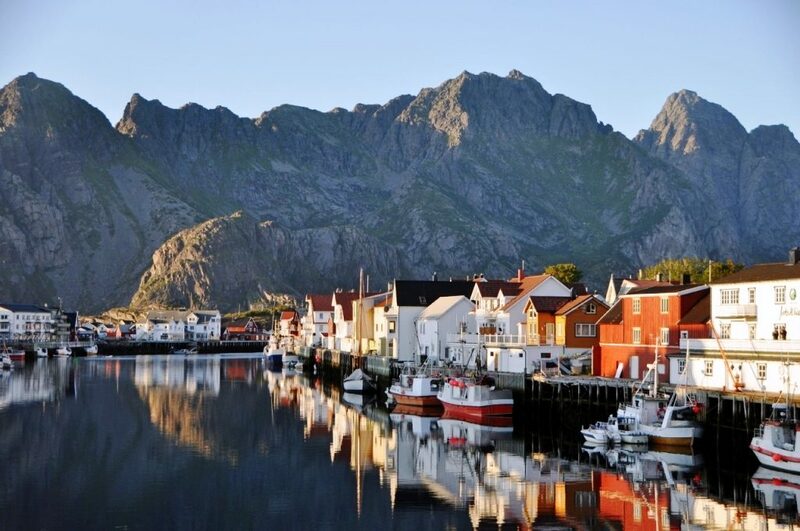 Views are to the famed fjords, mountains, and fishing villages and historic towns along this rugged coast, as well as to mountainous islands such as the Lofoten chain. Please let me know if you are interested. Our ship departs Bergen on 26 May and returns to Bergen on 06 June. I think this will be a really fun adventure with a group of friends. We are considering the possibility of hiking, cycling, kayaking or other adventures afterwards. Generally, Icelandair has inexpensive air prices from Portland/Seattle to Reykjavik and direct to Bergen, or you can easily find other carriers that offer travel to Oslo or Bergen. A fun excursion is the mountain railroad ride from Oslo to Bergen, and there are many interesting ventures to consider during a brief stay in Bergen. Paul and I hope you’ll join us on this scenic adventure. For more information, contact Shari at SkiMntr@aol.com or 425-260-9316. A White Christmas For Skiing!